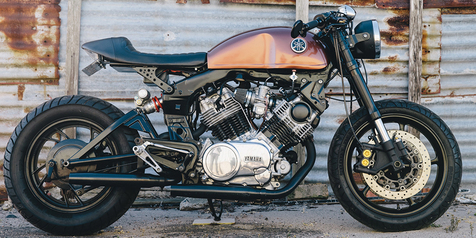 After 14 years of riding various bikes, Adriano actually interested in Yamaha XV750 to be modified with classic café racer style. But those desire is actually growing, making him want more powerful new artwork. 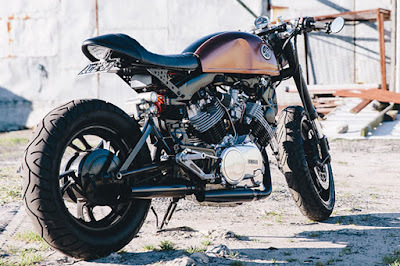 Finally, the matches focused on a cruiser bike, Yamaha XV1000 to be next work. An old 1982 Yamaha V-twin engined motorcycle for him looks more prominent when compared to the previous work on Yamaha XV750. 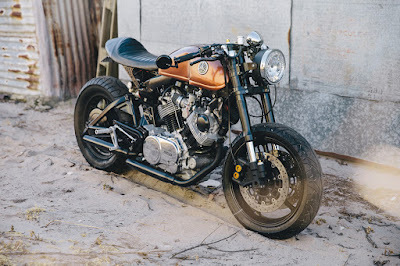 To get a motorcycle that has artistic value and attractive appearance like this, takes a long time. "A lot of the work until late at night, with the hard work poured energy to the perfect results," said Dave Marik of Archer Motorcyle who helps in realizing these café racer motorcycle modification. The process begins with an overhaul framework, many facets that are cut and re-forged to obtain maximum results. In addition to be pinned a fuel tank and custom café racer styled body. The motorcycles's drivetrain also restored, to get the maximum power. The Machine parts are visible to the eye such as engine blocks and others get a new touch of color, because the machine is also a part that wants to find. To add a solid display, the bike injecting more quality parts taken from Yamaha R6 for the front legs and back, as well as to get more comfortable suspentions. As for the other support parts such as stop lamp on the back, speedometer, headlamp and so on, are also pinned to adding perfection display.